I refashioned another of my husband's shirts recently. 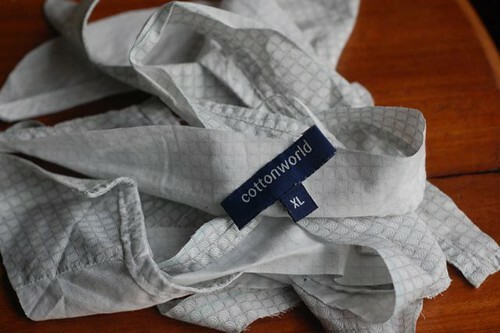 This one is from a store in India that mainly features cottons and linens in their collection. 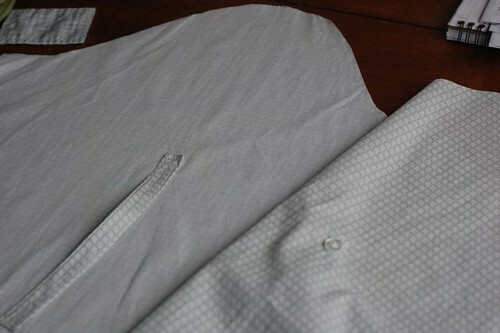 The fabric is very soft and summery, and I was quite excited to convert it into something to fit my wardrobe. I had less fabric to work with this time around - an Indian extra-large is a lot smaller than an Eddie Bauer large-tall. I followed the same steps as I did for my last refashion. The part I found tricky was trying to incorporate the shirt's shoulder/back detail, since I didn't want the cut-out to appear misplaced on my shirt, but I think it turned out well. Like the last time, the sleeves are my favourite part! 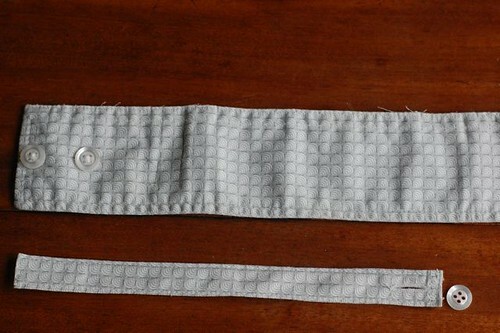 I used the original cuff to make tabs so that I can wear the sleeves rolled up or down. 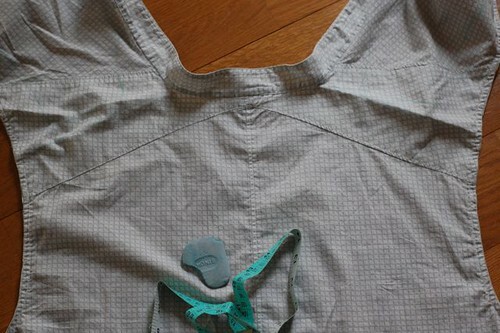 Like my previous refashion, I didn't shorten the shirt at all, and used the original hem. I left the back longer, used French seams, and finished the neck with bias tape made with left over bits of the sleeves. All-in-all, a refashion success, me thinks! Thanks to my husband for helping me with the photos. Love it! Really amazing how you (and by you, I mean YOU) can turn anything into a fit tailored for some(thing)one specific. Fantastic job! It's so lovely! Great fabric. It doesn't look like a refashion at all, actually! 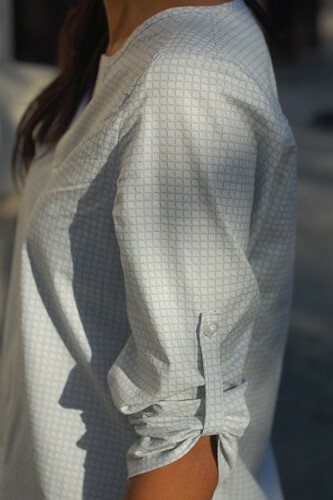 Awesome, I love men's shirt refashions!! This looks great! My husband keeps shrinking his shirts, and I LOVE your ideas! Thanks! This is so elegant and wearable, hope I can find a shirt big enough for me. Love it. Thanks for the tutorial. I am REALLY NEW to the whole DIY scene and would really appreciate help on how to actually alter the shirt to fit me. Can I maybe get the pattern for this?